I really enjoyed my visit to Freeway Park this week (see previous posts on Wednesday and Thursday,) but I regret not sketching much of its characteristic brutalist architecture. While it feels a bit 70s, it is fitting for a park that sits on top of a highway, and it is the mix of concrete and lush green spaces and fountains that makes this park stand out from others in Seattle. Nevertheless, there’s more to the park than the cubes of cement. Bob Anderson, president of the Jim Ellis Freeway Park Neighborhood Association, said a lot has changed in the past five years since the community and the Parks Department set out to implement a new landscape design for the park. Since last fall, more than 60 overgrown trees were cut and twice as many new ones have been added. The old trees, which were planted when the park opened in 1976, had created a canopy blocking the light and making it difficult for the plants below to grow. Even the Department of Transportation was starting to worry about the weight of the trees over the freeway. Now they’ve planted the kind of trees that will grow properly, said Anderson. 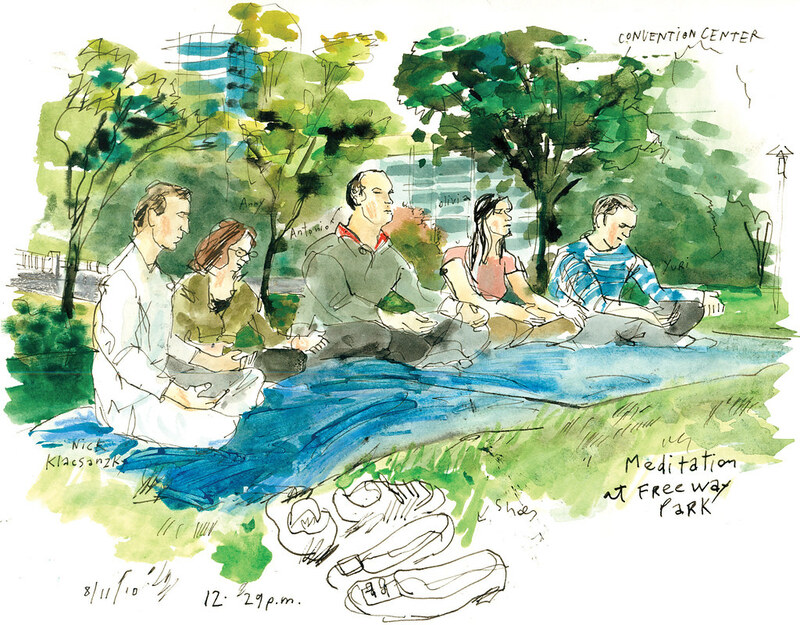 It was under the shade of the park’s trees that I sketched a group of people attending a meditation class, a scene I would have never expected to find at a park resting a few feet above I-5. I’ll tell that to my sketching friends when I propose coming here in the future. The park is hosting free weekly meditation classes, daily $1 book sales and dancing-till-dusk concerts through August. Information at freewayparkassociation.org. What would summer be without car shows? Next week I plan on taking my sketchpad to meet members of the Old Rides Car Club, a group of classic car enthusiasts in the Seattle Central area. They are gearing up for the Second Annual Columbia City Classic on Sunday, Aug. 22, an event that will feature over 120 cars from the 1920’s through the 1970’s. Those are my type of cars, with plenty of interesting angles and features that always make for a good drawing. For sketching ideas and feedback, don’t hesitate to contact me at gcampanario at seattletimes dot com. You can also follow my work on Twitter and Facebook. Have a peaceful weekend in the city!